Enjoy the healthy practice and tradition of the tea ceremony with this matcha making set. A serene centerpiece of Japanese tradition, the tea ceremony is a combination of cuisine and zen meditation. Bring a bit of this ancient culture and healthy practice to your life with this matcha (powdered green tea) making set. 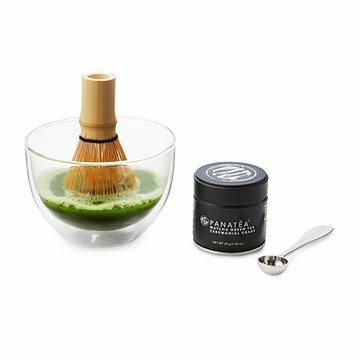 It includes everything you need to enjoy an everyday matcha moment: a tin of ceremonial-grade matcha, custom measuring scoop, double wall glass bowl, bamboo whisk, and instructional booklet. The matcha is made from only the youngest, first-harvest leaves, ensuring a rich flavor and high nutrient content. It makes a thoughtful gift for any foodie or mindfulness maven. Matcha made in Japan; tools made in China; set packaged in the USA. Tea: Tightly close lid and refrigerate after opening. Whisk: Rinse with cold water and pat dry.